Anita and her husband Pastor Rafael lead their church’s after-school program, which looks for creative ways to keep the children involved as they grow into adulthood. Project: To purchase electronic equipment (console, amplifiers, microphones, screen) and musical instruments (drums, keyboard, electric guitars) for use in a music classroom. The church in Villaflora, where SIFAT teams helped build a four-story building, will install a musical production classroom at its expense. The students in the church and after-school program have been raising funds themselves to turn an open classroom into a studio. 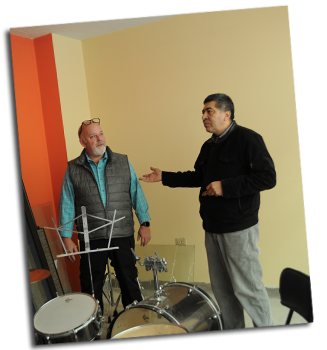 The church is asking for funds to purchase musical equipment and instruments for use in this classroom. The classroom will be an entertaining space where children, teenagers and young people can develop their musical skills and abilities to awaken in them the desire to serve God through music. As a result, this will help them with their integral development. Click on the button above to make an online donation to Anita’s project. Please choose Project 19-1 from the drop-down list.